i have just taken the Bayern job in my current save - never managed in the league before. it's my 2nd job coming from Rangers - couldn't get a job in the EPL with the top teams so took this 3 seasons in. when i came in at the end of the season i had £25m in the transfer kitty a few weeks later i was given £450m!!! Quoting myself but by checking those players out, I'll now assume you are playing on the 19.3 database. Marin doesn't cost too much actually, I have only run test saves so far but you can get him first window for around 9.5m. Only player I can't sign is Almiron, so it's not too bad if starting on the 19.3 database. 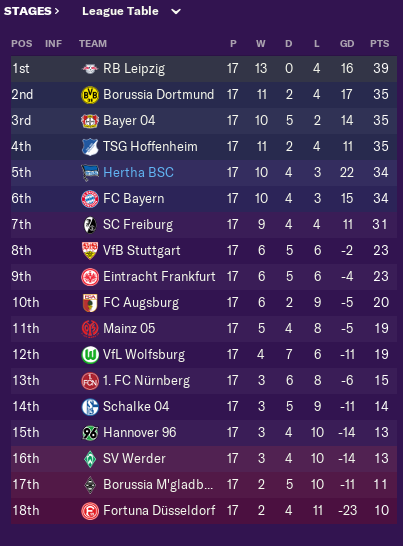 Another very good season domestically, as we secured the title with 4 games to play facing a surprising couple with Hannover 96 in second place and Mainz 05 in third. The latter qualifying for the second year straight into the UCL. Bayern had a very disappointing season and Klopp has been sacked as they fail a Top 4 finish. In the cups, both domestic and European we couldn't pass the Semi-Finals, failing against Bayern and Juventus (managed by Guardiola!) respectively. But I can't complain as I am managing to create a team composed by players either German home-grown or Club-trained, with only a few young exceptions. To achieve this we were certainly very active, spending over € 200M in the transfer market. Mayor transfer out included Alcacer, Witsel, Bürki, and Abdou Diallo for whom I accepted offers that I esteemed adequate given players' age or nationality and that helped us financed our many investments. Summing up all sales, we collected € 192M, reducing our net transfer expenses to just € 15M. Definitely, some good business there. The new players bought included. Johannes Eggestein coming in for free. My summer coups, the pair destined to replace Reus and Götze, Julian Brandt and Karl Havertz (for a combined fee of € 140M). I wanted to offload Bürki so in June I activated Timo Horn's release clause of € 17,5M. To replace Diallo, I secured Niklas Stark of Hertha and I needed a second winger and the best option was Leonardo Bittencourt from Hoffenheim. Other minor business thinking of the future included: 17 yo Patrick Olalekan, 18 yo Thiago Almada, and 18 yo Jonathan Burkardt. 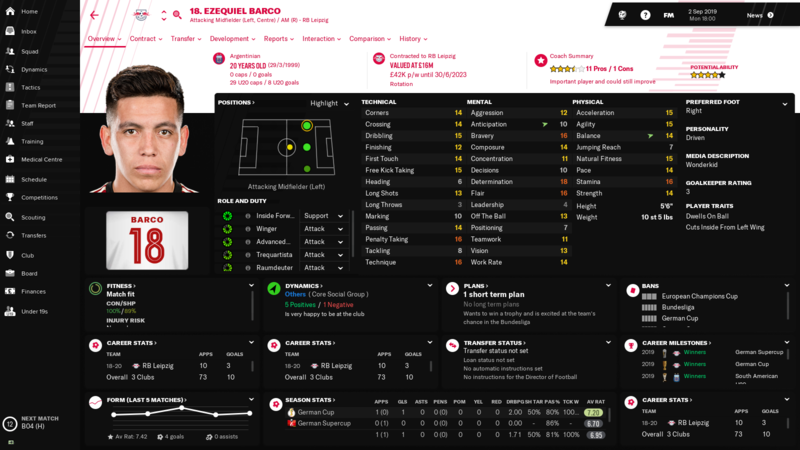 But as important as the new players, the new season saw also the coming back of the many young players that were on loan last year and that I want to introduce into the team: Felix Passlack will be our first choice right FB; Swedish wonderkid Alexander Isak will be our second choice Striker; and Dzenis Burnic entering rotation in the midfield. Below my First XI and their replacement for rotation. As you can see I also changed the tactic, it's an asymmetric 4-4-1-1, but it's thought to act more like a 4-4-2, with a Trequartista functioning both as a creative midfielder and as a second striker. On that note, Havertz playing in that position is our top season goalscorer banging in 20 goals, while Isak has once managed an incredible quintuple in a match. The tactic works well, as demonstrated by our U19 squad winning the UEFA Youth League. After such a busy summer, I don't expect movements unless to replace players who want to leave for a reason or the other. The only addition will be Matthijs de Ligt, it was a coup I couldn't let pass. The objective for next season is to pass the Semi-Finals in Europe and in the Pokal to try to bring a cup into our trophy cabinet. You're totally right, I use him as our third option...but he was available on a free, will defo loan him out next season. I am tempted to manage a team in Bundesliga, but not sure who?? Tempted to pick either Leverkusen or Gladbach, at the moment I am swaying toward Leverkusen. I'd suggest Leverkusen, not only they have an empty trophy cabinet you got many wonderkids and young prospects in Havertz, Brandt, Paulinho, Tah, and Bailey. 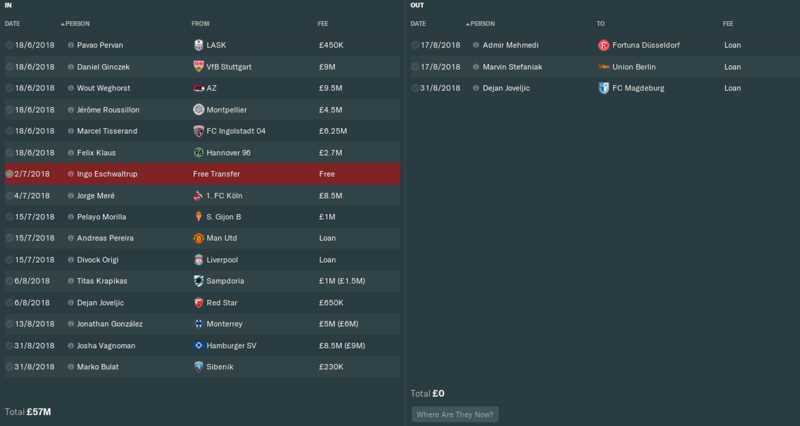 In general, I am amazed by the money available in the Bundesliga. Of course in the first season you won't have much to play with, but following a couple of good season, you'll got quite a war chest. I don't use them, putting there old wood and players above 19 who don't have a future in the first squad. In my II Team there is a handful of players, all transfer-listed or waiting for their contract to expire. I just dump the occasional guy who I can't loan out, there's the rare opportunity that they'll get promoted to 3 Liga (Dortmund II and Wolfsburg II have done in my Freiburg save) but other than that they're pretty much useless. Also, if you empty them out by selling everyone, even if you have 100% of responsibilities for the team and it has no staff, they'll still sign 3 or 4 players comen1st July. Especially frustrating for me in my Dortmund save was that they signed guys who were apparently too old for the II team and I kept getting prompted to promote them to the first team. Hasn't anyone chosen Eintracht? Is it a good team to choose as in real life? Still trying to decide on using attribute masking and disabling first window budgets for the very first time (been playing since 08). The more I think about it, the more realistic it sounds. So after having finished pre-season with Leverkusen, I marched on to Dortmund. However, when playing through it I noticed less of a spark and will from myself to play through like I did with Leverkusen but I still went on regardless to see what I could make out of it. As the squad in my opinion is pretty much fine, I only got in Boadu for around 10 million to function as my back-up striker/potential first striker, Kik Pierie for 14 million and Samardzic for 7 million. The latter 2 will get their games in Dortmund under 19 for the time being. As far as the Pulisic situation goes, I'm taking the risk to start him at right-wing, hoping that I'm able to purchase him back after season 1 should I pick Dortmund. A risk, but one I'm willing to take. Alcacer for now gets the benefit of the doubt, since with Sancho, Reus and Pulisic behind him respectively, I can't imagine him not scoring. Only off-loaded Phillip since I felt that with Paco and Gotze we already had two more than good options for the ST spot with Boadu coming in as well. As far as the back-up for Reus goes, I want to use and develop Sergio Gomez, but I feel Gotze gets wasted a bit as striker. For now, Sergio Gomez slots in at CAM, while Gotze and Boadu battle over ST. SHould Gotze not function there, I'd have to see how to still get Sergio Gomez in. At RB, I wanted to go for Vagnoman, but for some reason, he prefered Schalke. Not a shame, since I have Passlack returning the second season so I guess I have to use Hakimi, despite me not wanting to use him at first. Pisczek will be the first choice RB for the time being. Having finished the pre-season there, I marched on towards Leipzig to see what was possible there, and I must say that I think my choice for the Bundesliga is between them and Leverkusen. Werner is an absolute monster, truly unbelievable. Him, Haidara, Mukiele, Upamecano, Konate and Sarrachi will form the backbone of the team for years to come, while experienced guys like Forsberg, Kampl and Gulacsi are also pretty valuable to the team. As I felt the squad was good enough I pretty much only got talented youngsters in to develop. Managed to get my hands on Morilla, using his 1,4 million euros release clause, making him my back-up CAM behind Forsberg. Also got in AZ's Goudmijn, PSV's Ihattaren and Velez' Almada (The latter joining in july 2019). 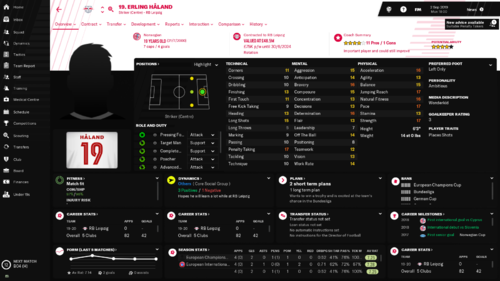 I also wanted a talented goalkeeper to replace Gulacsi long-term and assuming getting the Ter Stegen's of this world will take a while, I decided to go with Mile Svilar. Cost me 17,25 million euros but I have confidence in his potential. Only ones I'm not really convinced of this far are Cunha and Sabitzer and they thus are two players I'd be willing to sell to get in replacements. 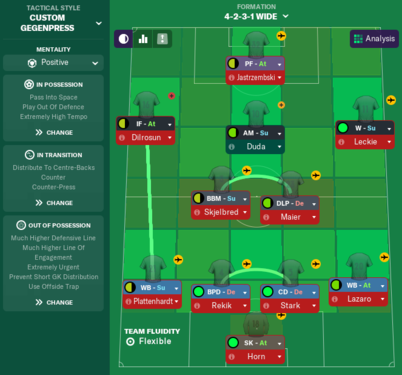 Since I also have Werner and Augustin already, decided to retrain Cunha as a left winger, since he, as a striker, is a natural goalscorer anyways. Looking to bring in Smith Rowe who looks absolutely insane for a 17-years old. Since I'm not sure I'd be able to get him off of Arsenal, for the first season, he's my back-up left winger. I refuse to develop their wonderkid at my expense. If I can get him permanently, he'd be an option to my left wing as first choice. Got rid of Poulsen since I couldn't really find a place for him in my tactic and got rid of Nukan too. Muller will probably end up rotting in Leipzig II, since I can't get rid of him. You just need to change the responsibility in the II Team tab of your staff responsibility. By putting yourself, they won't sign anyone. @RVP32 Good choice!! Watching their match against Hertha IRL and Reus just scored the winner at the 93'!! Surprised you decided to offload Phillip, he's been fantastic for me. Good luck with BVB!! No what I'm saying is that I have changed the responsibilities to myself, and they still sign players. On frees, they don't spend my transfer budget. But still annoying. So what do you all use? Attribute masking and first transfer window disabled? I'm leaning towards just the former but not the latter. Weird, I just began my third season and they never signed anyone. I would be über-pissed-off. Normally, I only disable the first transfer window. I know attribute masking increase realism, but I still prefer it. I'll be starting on 19.3 database as the only player I can't sign first window as a result of that is Almiron. Marin can still be purchased for under 10m. Its much more frustrating with Freiburg, who actually don't have that much money, compared to Dortmund with their huge transfer and wage budgets. I think you'll struggle. I tried and the demanded over £100m and I couldn't get it lower. Let him go back in January and my scouts expect I'd have to pay around £40m-£50m to get him. Yeah, I went in with an enquiry and they wanted 140 million euros. Quite the bummer. Anyways, finished pre-season with DOrtmund and Leipzig as well. Time to review it all! 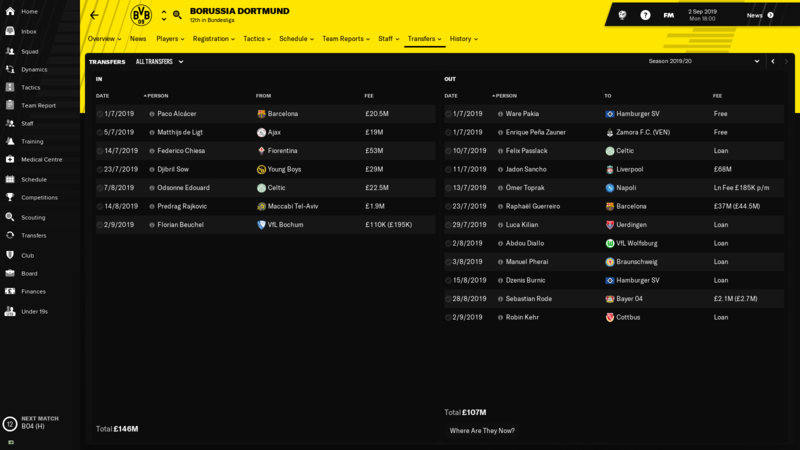 So looking at my Dortmund squad again, I felt a bit uncomfortable only having 1 proper right-winger in Pulisic, which wouldn't even be a guaranteed player, since I'm not sure if I'd succeed in buying him back off of Chelsea. As a result, I decided to get in Nicolas Pepe for 25 million euros. Feeling that they're kind of equal in terms of skill, they can battle it out. Paco Alcacer has pretty much been as invisible as can be in pre-season, so I'm not all too hopeful for the season. Luckily, I already found a potential replacement. Frankfurt's Luka Jovic. Unfortunately, Frankfurt has an optional future fee, preventing me from bidding on him. I did already have him scouted, and he'd probably cost me 45 million euros. Since I can't bid for him, I did already decide to declare interest, hoping that Frankfurt either doesn't buy him, or that he has more interest in joining Dortmund. Other than that, decided to use Gotze as a striker. Should Paco indeed continue his pre-season performance, Gotze will probably become the first-choice striker for the time being. A waste of his abilities, but with Reus being my first choice CAM, and Sergio Gomez at the club with the potential to improve, it's hard to find a proper place for Gotze without neglecting the other two. Decisions, decisions. It's going to be a hard one! Ah, I just negotiated with them for £9.5m straight away (test save) so when I start for real, I'll do what you done and hopefully get him for £5m. I won't be disabling the first transfer window either way, I want to bring in my own players and staff ASAP. Especially with Leverkusen only starting with 1 recognised LB. First season with Leipzig ended with me 3rd, we fell away after the winter break, and Werner struggled for goals. Bayern won the league easily, Dortmund inbetween us. Won the German Cup with a 3-0 win over Freiburg in the Final. Made the Europa League Semi, but lost 2-1 over two legs to Besiktas. Won 1-0 at home but conceded after 8 minutes second leg, Werner was then sent off and we conceded a free kick later on. Not done much in the Summer window so far. Bayern have spent £80m on Leon Bailey, while Dortmund have signed De Light. Think I'll struggle to keep up with them this year. Edited March 19 by RandomGuy. As I mentioned, Bayern and Dortmund have gone crazy this Summer.. I didnt bother trying to keep up, as I cant match them for wages. £37m up front, rising to £56m based on goals/appearances and winning the Bundesliga. Feels like a lot of money to spend on him, but for his age his physicals look unreal to me, and he'll provide a genuine alternative to Werner. It's the first time in months that I pressed 'Continue' in an actual real save! I've chosen to be Luís Figo to start his managing career at Borussia Dortmund! 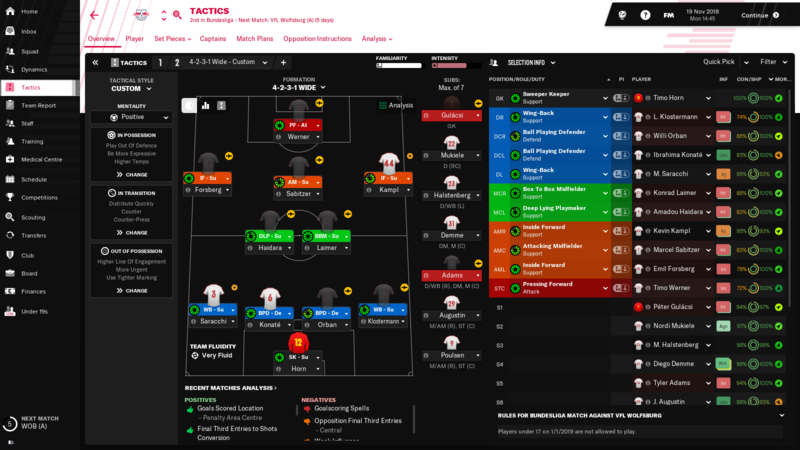 I've turned off summer transfer window and attribute masking, to use my scouting team before I buy someone. 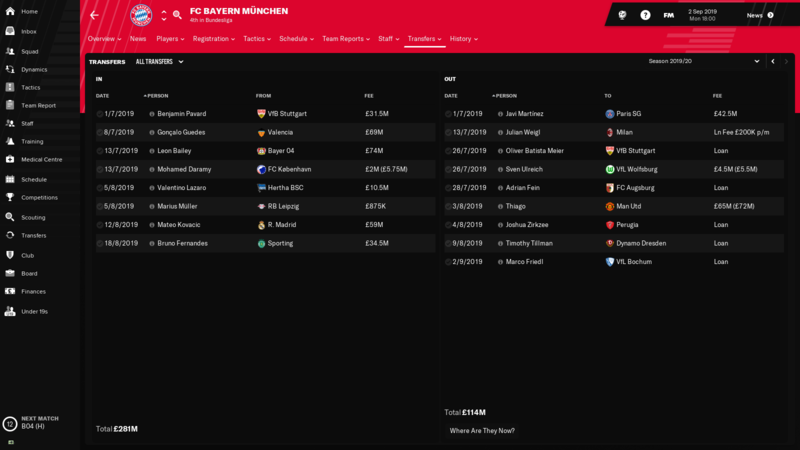 I've used the editor just for my own fun: I've removed the future transfers of Fiete Arp and Benjamin Pavard to Bayern Münich. 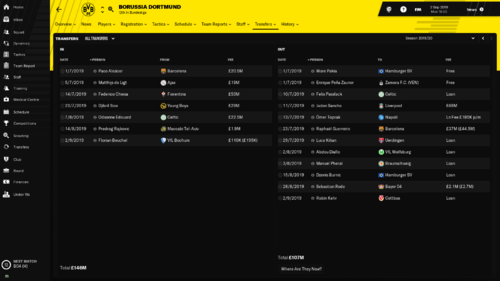 I've also altered the roles of Lars Ricken (to Assistant-Manager) and Michael Zorc (to Head of Youth Development) because I didn't want to sack some Dortmund Legends/Icons and I removed Luís Figo from the database! I'm not having a go at anyone, but it sort of annoys me that so many people are trying to get around Bayern signing Arp. He'll be incredible there and make them a force, surely half the fun of managing this league is trying to overthrow them? Each to their own, I guess. Personally I'm interested if they've somehow tried to implement the reality that Arp can apparently choose to join either summer 2019 or summer 2020, or if they've just gone "well, they're probably going to sign Werner so he'll think he's better off with another season at Hamburg" and set it that he joins in 2020. In my Leipzig save hes not joined them Summer 19 and is listed as joining Summer 20, so I think you're right, but I don't know if the AI manager that choice. Started what will be a lengthy pursuit of Kai Havertz. I want to replace Forsberg and Kampl within three years and he looks perfect for that in my set up. 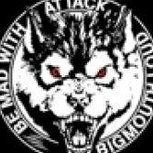 They guy Wolf that's a pre arranged deal doesn't look too great. I started a new game as Eintracht a couple of days ago and am enjoying it so far. I didn't see a great need to immediately make any signings, I brought in Ihlas Bebou from Hannover to play on the right wing, with Rebic on the left and Jovic and Haller up front. Playing a very simple flat 4-4-2 which delivered great preseason results and saw us draw 0-0 with Bayern in the Super Cup and beat them on penalties. Only one game into the season, a frustrating 1-1 draw at Freiburg, but I'm optimistic about our chances of a successful season. Jovic's future fee in his loan contract is just over £6m, which is a steal relative to his value. Will have to cash that in before the end of the season, though I'll likely wait until next season's budgets are announced. @GylfiAsCharged....i am at still at preseason. I thought the team would have more quality after the winter update....but it is not the case. The thing is that i am trying to replicate their real life tactics (i know some guys have written about this) but without success yet. I mean the preseason results are not good enough.....nevertheless it seems like a decent challenge save !!!! Any one else any more thoughts on Frankfurt ? SO decided to go with Leverkusen for the time being. (Since I also had a save with them before the 19.3 patch). 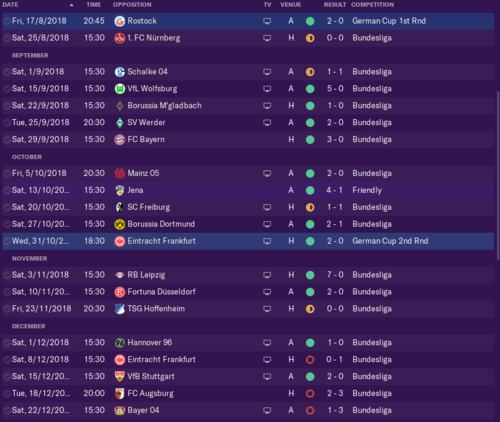 I did have Weiser and Bellarabi moaning for gametime, but was unable to convince both that my first choices were in great form (And this was just a day after Bailey slaughtered Dortmund). Good fun still and let's see how long I can keep it up before the temptation of Dortmund, Leipzig and possibly Frankfurt starts making its way over to me again. A wee hidden gem in the Leipzig youth system, maybe. Been quality for me so far and is first choice DM when I play that system now. Currently in november and it's been smooth sailing so far. The Euro League group is so easy I can just play it with my second team. More and more players have began moaning for playtime despite playing an equal amount of games as my first team! And from my first team, nobody has even moaned once! Paulinho's continuing his goalscoring form, while Tah is turning more and more into a one-man wall. Vagnoman is starting to get comfortable as well while Bailey is turning left backs inside out. I do notice that there is very little movement with this match engine. Which is quite a problem if you play against teams that park 2 busses. Sadly, in the Bundesliga that are a handful of teams (Already seen flat 4 at the back with a DM in front of it and then a flat 4 before that, a flat 5 backline with a flat 4 midfield and 3 centre backs with wingbacks), as a result, players just proceed going for the shot. Big shame because it's just squandering. The only thing I'm not that happy about is the fact that, stat-wise, I don't get the best out of Havertz. He tends to play okay to good but in terms of assists and goalscoring it's all just not that good. However, I think that's more so a CAM thing, since my CAMs tend to be not as visible for most of the time. I think I'm going to ask him to place shots though because he powers quite a lot of shots over the goal. He develops well so that's a nice thing. @RVP32 How are the finances looking? When I started my test save with Leverkusen, the finances took quite a hit after the first transfer window. Do you make a loss every month? But yeah, despite making a loss every month, they did increase it to 75 percent in october (I believe). Luckily I don't really have big plans for the januari window. Other than that, I don't keep a hold of my finances all too much. I just take a glance over it when the monthly financial update comes in and that's about it. Haven't had a save that I have been addicted to in months so thought I would try out a Bundesliga save for the first save. Decided to be Hertha Berlin, mainly due to the idea of them being a capital club that is not a heavyweight as well as the fact they have Matthew Leckie who used to play for my local team. Only realised upon starting the save just how many good young prospects I have at my disposal. So far have played 3 league games and one in the cup and done pretty well. Beat 3rd tier Rostock 2-0 in the cup with ease with a second string side. Draws with Nurnberg (0-0) and Schalke (1-1) were disappointing, particularly Schalke as they equalised in the 93rd minute. Things turned back around in my last game though, smashed Wolfsburg away from home 5-0, Ondrej Duda picked up 4 assists. Guy definitely looks like my key player. Only made one signing, bringing in Timo Horn for 10.5m, then sold the original starting keeper Rune Jarstein for 3.8m. Currently we only have 8 players who are over the age of 26, and most of them are guys who aren't in my plans. Club captain Ibisevic (34) doesn't suit my style and I can't see myself playing him at all, Peter Pekarik (31) is a third choice RB I will be selling as soon as he recovers from injury, Fabian Lustenberger (30) already has a transfer arranged and is extremely injury prone. Then there is Kalou (33), Darida (28) and Leckie (27) who will get some use this season most likely but might look to sell Darida while I can next year. Finally got Skjelbred (31) and Kraft (30) who are just squad players but will prove handy for now. Then there are my young guys, which is literally the rest of the team. Really excited about Duda (23) who I can hopefully keep, then got a really good set of young starters with Maier (19), Stark (23), Rekik (22), Lazaro (22), Dilrosun (20) and Selke (23). Good young squad players in Kopke (23), Dardai (19), Mittelstadt (21) and Torunarigha (21). Then two guys who aren't quite ready to start but look like they're gonna be world beaters, Julius Kade (19) and especially Dennis Jastrzembski who has been tearing up in training and with the 19's. Really nice to be enjoying FM again! Having all these young prospects has got me excited, want to try and promote as much youth as possible and then try and be one of the biggest clubs in Germany! 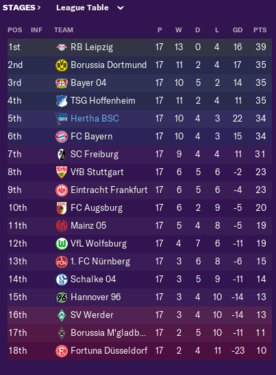 It has been a fantastic start to the season for my Hertha Berlin side, as we currently sit in 5th and just one point behind second placed Borussia Dortmund. It could have been a lot better though, considering we sat top of the league for a considerable amount of time. My defence has been the highlight, with just ten goals conceded in 17 games - with eleven clean sheets. After a few dull draws, our season really kicked into gear with a 5-0 thumping of Wolfsburg. We struggled to settle on a main striker in these early games, with preferred striker Davie Selkie out injured and club captain Ibisevic not fitting into my system. We started out with Pascal Kopke up front for a few games but he wasn't scoring despite decent average ratings. I then decided to take a risk and go for 18 year old Dennis Jastrzembski who had been getting consistent 10.0 ratings in training and scoring loads in the 19's. Although he was normally a left winger. I brought him on for his debut against Moenchengladbach and he scored the winner! From then on he became a regular and is currently the top scorer in the Bundesliga with 10. Other notable results include a 3-0 victory over Bayern Munich. We outplayed the champions with a brace from Jastrzembski and a goal from Per Sjkelbred giving us the win. We also secured a shock win away at Borussia Dortmund - Jastrzembski again scoring, this time the winner. Our next league game was a top of the table clash, with RB Leipzig. I was left gobsmacked as we absolutely destroyed them 7-0 to go top of the league, it was 6-0 at half time. Jastrzembski this time contributed a hat-trick, Leckie and Dilrosun were both on fire as well. In recent games, we have begun to falter slightly mainly due to picking up a few injuries. Our first loss of the season was to lowly Frankfurt who beat us 1-0 in the last minute after we dominated most of the match. Augsburg we again dominated, and looked to have secured a 2-2 draw before a 90th minute own goal meant we had lost 2 in 3 games. Leverkusen was our first truly bad performance of the season, showing worrying signs as we slipped out of the top 4 for the first time since September. As mentioned, Jastrzembski has been a revelation up front with his goalscoring efforts, a goal every 111 minutes. He even won the European Golden Boy! Dilrosun has also proved sensational, providing 6 goals and 3 assists from the left wing. The biggest surprise though has been Per Skjelbred. At 31 years old, I initially did not intend to play him much but a long term injury to Duda (who has just recovered) and injuries to Arnie Maier forced him into the team and I have been unable to drop him ever since. He has scored 6 goals this season from a box to box midfield role and only Jastrzembski, Reus, Werner and Mario Gomez have scored more than him in the Bundesliga. The biggest part of our team though has been our defence, Lazaro, Stark, Rekik and Plattenhardt have been incredible this season and made us have the best defence in the league. We have only conceded 6 goals all season when those four have played together and I would put our recent dip in form down to a suspension to Stark and an injury to Rekik which saw us have to switch up our defence for the first time. My first season with Leverkusen has come to an end, and compared to the first half of the season, the 2nd one has been... hot and cold. I drew a lot more, my striker's goalscoring production just dried up, Havertz might as well have not been on the pitch most of the time, stupid defensive errors, my goalkeeper being some sort of weird lovechild of Courtois and Karius and absolute screamers being scored against me while my players can't even aim at the goal across 5 meters. Managed to salvage it still, but not happy about Havertz' contribution. While 14 goals and 9 assists aren't bad, he's had a lot of games where he was just invisible. Still has plenty to offer. However, the negative part, Bailey and Brandt want to leave and simply can't be persuaded otherwise. I would be fine with letting 1 of the 2 leave (My preference going out to Brandt. ), but the both of them? Man. Should Brandt leave, I'd defo like to get in Sané, but he'll be very expensive, unless I can get him for the amount that I expect to sell Brandt for. Then Wendell came for a new contract while under interest of Milan and Juventus. I refused his request, hoping to sell him for big bucks so I could play Itter, but, the interest faded away and now I'm stuck with an unhappy player. Barcelona sniffed around Tah, did enquiry and as you can guess, Tah was the next one saying he wanted to leave. I managed to persuade him by telling him we'd try to reach a certain phase in the CL. Let's hope I can abide to that so he will want to stay. Meanwhile, Paulinho... As said, his goalscoring forming just disappeared the second half of the season, missing absolute sitters, while some chances were rebounds in front of an opengoal that their goalkeeper somehow still managed to get! They tend to be superhumans against me for some reason! 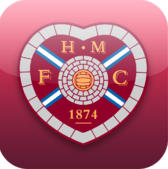 Milinkovic hasn't developed at all, so not sure if he'll continue to stay Tah's first-choice partner. However, I'm not sure if I'm going on to a second season. Could be me but I just find no enjoyment in the match engine. As soon as teams start to play defensively or play with 5 at the back I struggle to score any, purely because players just don't attack the ball when it's crossed. Going to pause for a couple of days, mess around a bit and see if I'll continue or take a whole new team. Jumped into the Bundesliga, first time in a long time! Started a save with Wolfsburg. Offers a good starting squad, decent transfer budget, one or two quality youngsters, and great facilities. Pretty much a perfect starting club for FM players. First signing through the door is Jorge Meré. I feel it was a good price for him, a player who can slot straight into my first team, and has a lot of potential to improve...I have a vision of Meré and Uduokhai as my DC partnership in a season or two! Pelayo Morilla is a player wh could be our star AMC in 3 seasons, so a lot is expected. Pereira and Origi come in on loan, with no realistic transfer targets available, it fills the gaps I have in the team for this season at least. Also both out of contract at parent clubs at end of season, so this is almost an audition for them both. Titas Krapikas is potentially our next number 1, with some goo all round stats now, whih can only improve. Joveljic a no brainer, so no explanation needed. Jonathan Gonzalez for me looks an outstanding ball winner, and if / when we sell Camacho, he'll slot straight into his CM role with little effort, and some room to grow as well. Josha Vagnoman should be my DR for the next 15 seasons so to sign for less than £10m now seems a easy decision, and will give William strong competition this season. Marko Bulat is not one I've heard of before, but his stats at the age of 16 are very, very good, and I can only see him getting better. Potentially in the first team by the age of 19/20. Opened the season with a 2-0 win over Schalke (Ntep, Steffen), followed by a awful 4-1 defeat at Leverkusen (Camacho). We followed that with a solid 1-0 win against Hertha (Ntep). I'm looking for European qualification minimum this season (top 6), along with a good cup run. I think we have a good chance of the top 6 finish, with Bayern, Dortmund and Leipzig the only three teams I feel that are ahead of everyone else. Our main competition will be Gladbach, Schalke, Horrenheim and potentially Eintracht Frankfurt. I'm hoping three of the four will drop points due to their European campaigns, which is where we can make up the ground. 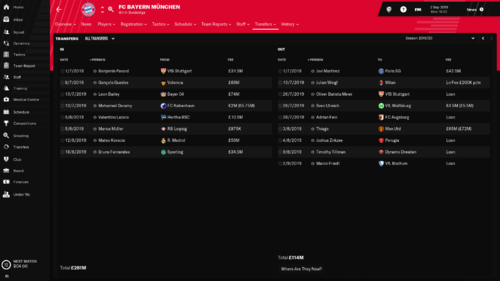 Hoping that I will slowly start to integrate the younger players into the first team, with Vagnoman (DR), Krapikas (GK), Gonzalez (DM), Itter (DL) and Brekalo (AML) all within a good chance of getting games this term. I'll potentially send one or two out on loan in January, such as Morilla and Krapikas. Really have to get back into my Dortmund save. I started a new game as Eintracht a couple of days ago and am enjoying it so far. 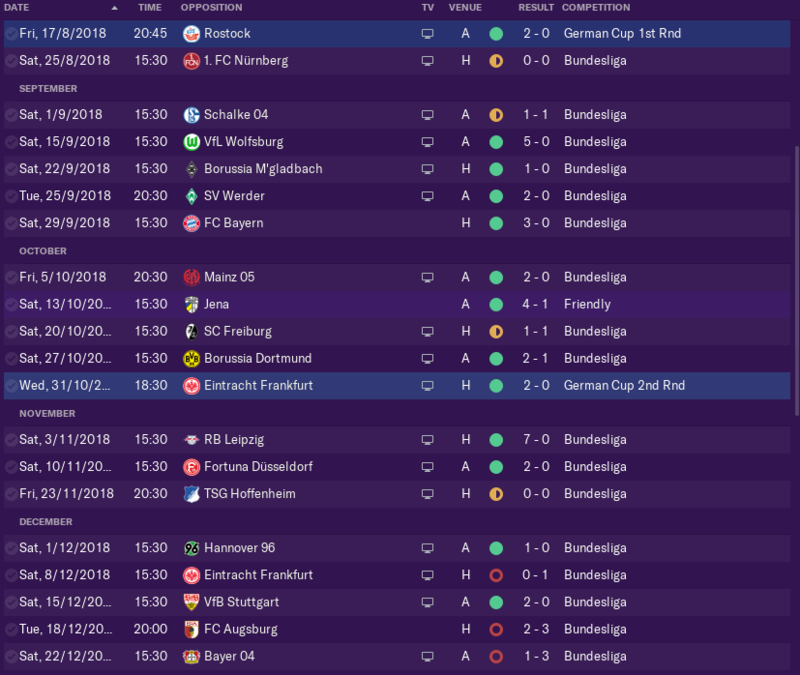 I started an Eintracht game pre Winter-update, and it was one of the hardest struggles in my FM career. Things already started badly when I had to leave some players with high influence among the squad out of the Europa League squad. Their discontent soon developed into a rebellion. 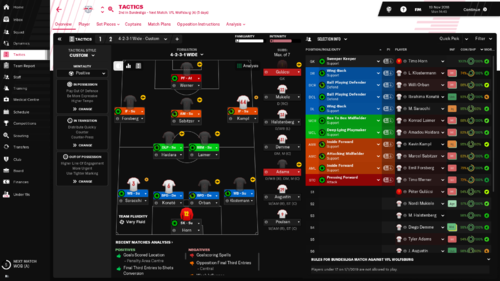 I also had a very hard time to copy the real Eintracht Frankfurt system to the FM, especially with the strikers. But I think the Winter update at least partly fixed that problem. Great to hear you did better than me!